Sharjah: Children and teenagers with an ambition for acting in Hollywood productions and in television programmes have an exciting new opportunity to explore acting at Sharjah’s premier family leisure destination, Al Qasba. 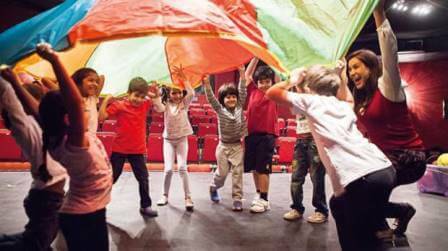 Organised at the destination’s Masrah Al Qasba Theatre, the LAMDA (London Academy of Music and Dramatic Art) speech and drama classes will be conducted by Dubai-based Centre Stage Arts. For 11 Saturdays, starting January 20 until March 31, children in the age group of 5 to 16 years will be offered age appropriate and specialised full-term courses that will enable them to explore various facets of the world of drama and performing arts, stimulate creativity and challenge their imagination in a fun environment. The youngest lot will be encouraged to delight in different themes, delve into dressing up in boxes to transform themselves into their favourite characters and bring the whole experience to life. Act 2 participants will explore a wide range of drama, poetry, prose, performance techniques and drama games, and learn to express themselves through their bodies and through language. Among other things, attendees of Act 3 will be introduced to numerous acting techniques in order to create believable performances and interpretation. He added: “Speech and drama classes aren’t just about acting or singing. They can help children and young adults express themselves better, explore and communicate creative ideas, build vocabulary as well as confidence.” Class sizes will be kept to a minimum allowing no more than 15 children in a batch — a strategy organisers say will ensure each participant is afforded the time and attention they require to enjoy the lessons and take away lifelong learning from them. For course payments and online registration, parents and schools can directly contact Centre Stage Arts through centrestage-arts.com. To be able to make the most of the sessions, children must be fairly comfortable conversing and receiving instructions in the English language. At the end of the course, the participants will qualify to take the London Academy of Music and Dramatic Art (LAMDA) Examination, which is held every once a year in April/May. Participants will be informed of the examination details and those who take it will receive a certificate upon completion. What is on offer? Age appropriate and specialised full-term courses in acting that will enable them to explore the various facets of the world of drama and performing arts, stimulate creativity and challenge their imagination in a fun environment. What is the age-wise classes format? The classes have been separated thus: Act 1 for 5-7 years of age; Act 2 for 8-11 years of age and Act 3 for 12-16 years of age.